Here is a comparison of HPCS Singularity vs NeRSC Shifter. They both bring the benefits of container to the HPC world. As such, both provide very similar features. The subtleties are in their implementation approach. MPI maybe the place with the biggest difference. Please comment on the blogger comment section to improve the doc. Much thanks! Reproducibility, run cross platform, provide support for legacy OS and apps. Utilize the large number of docker apps. Provides a way to run them in HPC after a conversion process. It also strip out all the requirements of root so that they are runnable as user process. Interaction w/ Docker Singularity work completely independent of Docker. Shifter primary workflow is to pull and convert docker image into shifter image. Image Gateway connects to Docker Hub using its build-in functions, docker does not need to be installed. A validated image containing high energy particle physics workflow. Single image file. Container purpose build for singularity. Can import docker images. Working to accept docker file or Rocket definition syntax as Singularity definition. Image Gateway pulls from Docker Hub, automatically convert to shifter image. Newer version of Linux that supports Docker/cgroup. Resource Orchaestration SwarmKit provided by Docker Scheduler's job to spin multiple instances on multiple nodes Yes. Namespace isolation paradigm By Default, share little. PID 1 is not init, but the process started by docker. User inside container cannot see hosts' processes. HPC workflow doesn't benefit much from process isolation, thus by default share most everything, so process running inside container is largely the same as running on actual host. But process namespace isolation can easily be enabled. While inside a singularity shell, ps -ef shows all process of host, or those of other containers. container user can kill PID of process on host. User does not change ID inside container, cannot become root from inside the process. Network is transparent to the process. /home mount is made available in container, -B will add additional bind mounts easily. 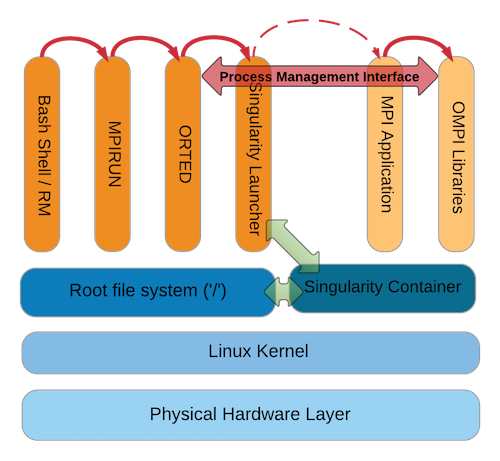 Singularity has build-in support for MPI (OpenMPI, MPICH, IntelMPI). Once app is build with MPI libraries, execute mpirun as normal, replacing the usual binary with the single file singularity app. While the app is running inside the singularity container, Process Management Interface (PMI/PMIx) calls will pass thru the singularity launcher onto ORTED. This is what MPI is designed to do, no hacks, so works well. Shifter relies on MPICH Application Binary Interface (ABI). The mpirun command is executed on the host. The mpi_ring command is from inside the container. PMIx in OpenMPI perform a version handshake, and everything will work so long as the host's version is equal or newer than the one inside the container. MPI host list come from the host, the container don't need to worry about host discovery. See the singularity mpi diagram below for MPI call flow details. Network access Utilize Network Namespace. NAT is default Transparent. Access network like any user process would. Transparent? Host's file system access docker run -v hostpath:containerpath will bind mount to make host's FS accessible to container. container can be modified and saved. root access possible. Singularity app run as a user process, therefore it has access to all of host's fs and devices that any user process have access to, including specially optimized FS like Lustre and GPFS. Singularity performs a bind mount between host's mount to the inside of the container. Container writable if started with -w.
Start shifter with volume mapping, done using loop dev. User has access to all typical mounts from host. Allows mounting a localized loop mounted file system on each node to act as a local cache, especially useful in diskless cluster. Container is writable at run time, but need to issue docker commit from outside the container for changes to persist. No host FS mounted/mapped by default. Can use -w flag of singularity to start container in read/write mode. root to install singularity, sexec-setuid need setuid root to work correctly. Head and compute nodes need to be newer version of Linux that supports Docker (eg RHEL 7). Interactive build container, then use docker commit. Pull existing image from repository such as docker hub, docker store, private repository. Interactive expand on existing image by leveraging (sudo) singularity shell -w.
Import/convert a docker image into a singularity image singularity import. Abilities to run image in other format (eg ext4), but not sure how such container image is provisioned. No change in security paradigm. User run singularity image/app without special privileges. Option to start only root-owned container image. root to install shifter binary. Need special integration into scheduler (or only in cray cuz they are special?). User run shifter image/app without special privileges. Container started as normal user cannot use su or sudo to become root; singularity utilize kernel's NO_NEW_PRIV flag (Kernel 3.5 and above). Performance Docker container startup time is much faster than traditional VM, as it does not need to emaulate hardware and is essentially just starting a new process. Container startup time a bit faster than docker, as it does away with much of the namespace settings. On Lustre backed system, where metadata lookup span different server than data block lookup, single file container image significantly improve performance by reducing multitude of meta data lookup with the MDS. On Lustre backed system, where metadata lookup span different server than data block lookup, single file container image significantly improve performance by reducing multitude of meta data lookup with the MDS. Misc Singularity app can run outside HPC, without any job scheduler. It can serve as a container for app portability outside the HPC world, and since a single file encompass the whole container, this maybe advantageous for sharing, portability and archive. Singularity recommends compiling all apps into the Singularity container, spec files would need to be written. I hear they are looking to adopt Docker and/or RKT specfile to minimize this burden. Docker files can be imported or even run directly. Given docker operate on a different paradigm, the hit-and-miss outcome of such conversion is understandable. In future development, maybe NeRSC's shifter could run singularity app as well. Shifter container/app can run as stand alone outside HPC scheduler. This is certainly useful for testing and development. However, if one isn't trying to utilize container in HPC, maybe there is not much point in converting docker images to shifter images. Shifter works by pulling the large number of existing containers. Docker isn't needed inside the HPC, some gateway location can be used for Shifter to pull docker images and store converted image in a location accessible cluster-wide, eg /scratch. See shifter workflow below for more details. Feel High :) Building a singularity 2.2 image feels a lot like building a VM using kickstart file. Adopters Like wildfire by internet companies UC Berkeley, Stanford, TACC, SDSC, GSI, HPC-UGent, Perdue, UFL, NIH, etc. Seems like the non-cray community is gravitating toward Singularity. NeRSC, VLSCI, CSCS, CERN, etc. Seems like the big physics number crunchers are gravitating toward shifter, cuz they use Cray or IBM Blue Gene? As per CSCS/ETH slide share, based on Shifter 15.12.0. As per Greg Kurtzer keynote at HPC Advisory Council 2017 @ Stanford, based on Singularity 2.2.
docker run -i -t -p 8888:8888 continuumio/anaconda /bin/bash -c "/opt/conda/bin/conda install jupyter -y --quiet && mkdir /opt/notebooks && /opt/conda/bin/jupyter notebook --notebook-dir=/opt/notebooks --ip='*' --port=8888 --no-browser"
# Create an image file to host the content of the container. # Think of it like creating the virtual hard drive for a VM. # RHEL6/ext3 img take up their final file size. # Note that uname and uptime will always report info of the host, not the container. # best to build up container using kickstart mentality. # re-run bootstrap command again. # unix commands can be run, but if there is any error, the bootstrap process ends. # Copyright (c) 2015-2016, Gregory M. Kurtzer. All rights reserved. # required approvals from the U.S. Dept. of Energy). All rights reserved. echo "This is what happens when you run the container..."
echo "Hello from inside the container"
# bootstrap will terminate on first error, so be careful! 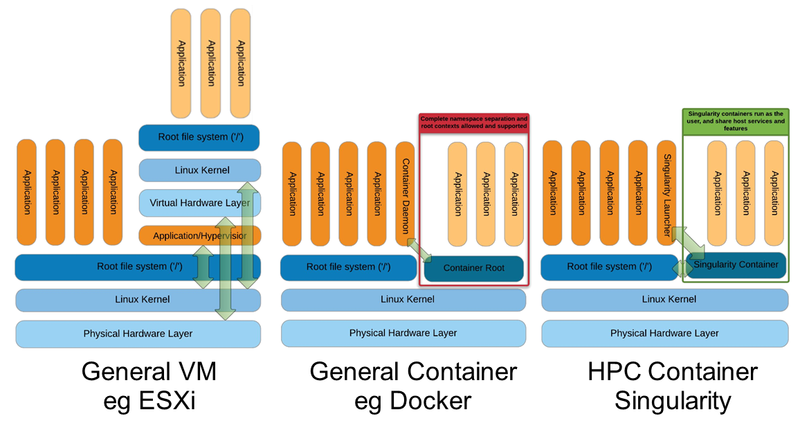 State of Linux Container (include comparison with VM) by Christian Kniep in 2017 HPC Advisory Council @ Stanford: video and slides. Singularity: Container for Science and reproducibility Video and slides of Keynote HPC Advisory Council 2017 @ Stanford by Greg Kurtzer. It also present the challenges of using Docker in the HPC world. NIH's singularity app page, contains full info on how to use singularity in HPC, with GPU and docker hub. Admin mag Cover background of container and problem of using Docker in HPC. Also has setup and example run with singularity, but this is for version 1.x of singularity, which is very different than 2.x. Motivation and implementation approach presented by Greg on interview with Admin Magazine. It was shortly before the 1.0 release, but desire and approach reflects in the 2.x release as well. Shifter presentation at CHEP 2016 by Lisa Gerhardt et al. User defined images NeRSC documentation. Container and HPC slide share. Shifter vs Docker documentation at VLSCI, with step-by-step instructions on how to obtain and build a shifter app in a SLURM cluster. Univa Grid Engine Container Edition pdf.